For the ponzu dressing, pour the mirin, soy sauce, vinegar and kombu into a small saucepan and bring to a simmer. Cook for three minutes, or until reduced by almost half, stirring occasionally. Remove the pan from the heat and leave to cool. When the liquid has cooled, remove the kombu and stir in the ponzu or lemon juice. (Add a little extra lemon juice if necessary just before serving – you want the dressing to taste very zingy.) Pour into individual dipping bowls and place on serving plates with slender lemon wedges. (Alternatively, put in a small bowl and place on a serving platter.) Add the spring onion and dried flaked chilli (if you like – not strictly authentic but a nice touch). Fill a large saucepan with enough water to go a third of the way up the sides. Bring to the boil over a high heat. Add the asparagus spears, cutting any particularly long or thick spears diagonally in half first. Return to the boil and cook for 1½ minutes, or until just tender. Drain in a colander under running water until cold. Pat dry with kitchen paper and set aside. To make the batter, put the cornflour, self-raising flour and sesame seeds into a large bowl and mix until thoroughly combined. Make a well in the centre. Whisk the egg yolk with half of the water in a separate bowl and gradually add to the flour mixture, using a whisk to draw the dry ingredients into the liquid. When the batter is thick, slowly whisk in the remaining liquid until the batter is just mixed. Don’t over-whisk or make the batter too smooth. If using medium or king scallops, cut in half horizontally through the middle. Leave small queen scallops whole. Drop 10-12 of the scallops or scallop pieces into the batter and turn until lightly coated. Working quickly, take one at a time with tongs or a couple of forks and drop gently into the hot oil. Keep the bowl close to your saucepan or fryer as the batter is thin and will drip off quite quickly. Drop the scallops into different areas of the pan so that they don’t get a chance to stick together. Once all the battered scallop pieces are in the oil, fry for 2–2 ½ minutes, or until pale golden-brown and very crisp. Keep an eye on the temperature of the oil so that it doesn’t overheat or cool too far. 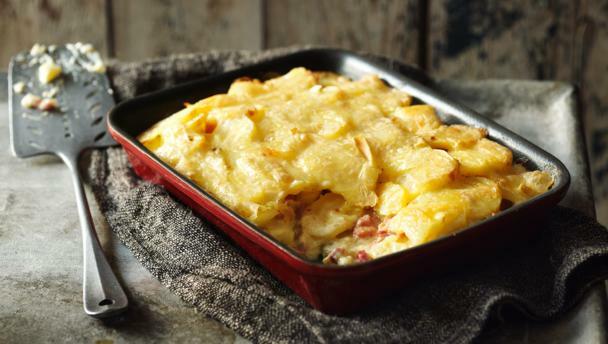 Use a heatproof slotted spoon to scoop up any bits of the batter that separate from the scallops and to nudge any scallops that stick to the bottom of the pan. They should all float as they fry. Remove the tempura scallops with the slotted spoon and drain on kitchen paper. Continue frying the remaining scallops in batches as above until they are all cooked. Add the asparagus to the batter, in batches if necessary, and cook as above for 1½-2 minutes, or until crisp. Drain on kitchen paper. 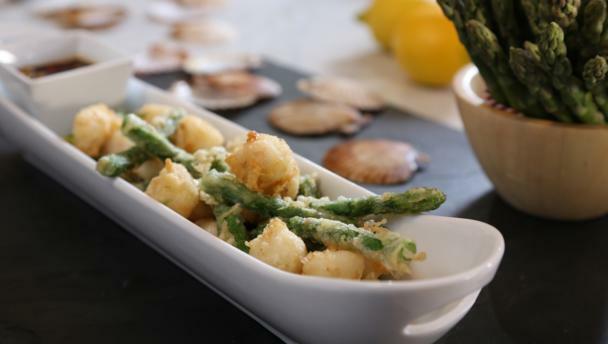 Arrange the scallops and asparagus on the serving plates with the ponzu dressing and lemon wedges for garnish. Serve immediately.